Rumi: Do Antum recognize various paths out there? Disciple: Just a little, Master. Rumi: Use your heart’s eyes! Antum can see a lot of paths out there. There are big ones, some small ones. Some are straight, some are twisting. Some are safe, many are vulnerable. There are even many sham paths out there. Rumi: Do you know, the biggest, the straightest forward and the safest road is the Path of Al-Mustafa. Rumi: Antum knows my degree? Disciple: Not very clear, Master. 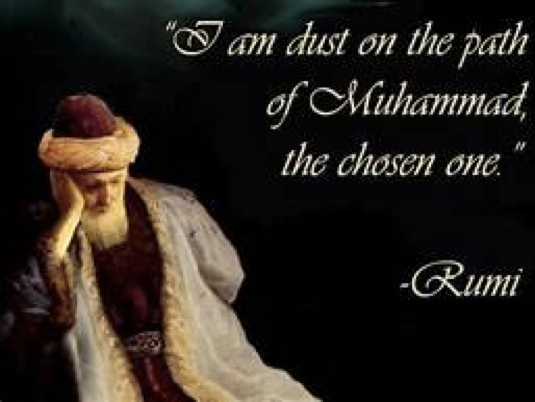 Rumi: I am just dust on the Al-Mustafa path. But I was lucky as blessed with a little fragrance. Only slightly. Can you smell it? Rumi: Antum knows who loves Al-Mustafa the most? Rumi: Bilal. After being left by her lover, she was no longer willing to call people for prayer. When the caliph persuaded him he dodged: “Let me become a Muezzin for the Apostle only,” he said. There was no way to force him. Because, if forced, he will only be able to arrive at this part: “waasyhadu anna Muhammadan ar-Rasulullah“. [Hearing this the disciple was just stunned, trying to imagine the situation. Seeing the students stay silent, Rumi continued]. Rumi: Antum knows what is most loved and loved by Al-Mustafa? Disciple: Just a little but uncertain, Master. Antum is a familiar phrase for “you”. The term bird language (Arabic: mantiq al-thair) is used by holy texts to convey higher truths. The sacred text alludes to Solomon as a prophet who understands this language. Al-Mustafa (Arabic) means chosen (the chosen one). Rumi used to use this term to refer to the Prophet SAW. This term refers to marginalized groups in society, including the needy and the poor.